Background Note: I’m new to armour modelling, after having last built an AFV 36 years ago as a boy of 12. So my apologies in advance to those more expert than me if a few of my facts are slightly off. 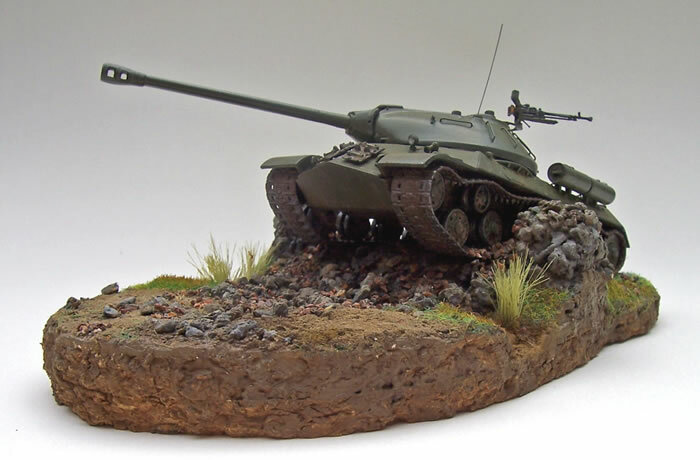 The IS-3 was a the third in a line of development of the successful IS tanks which saw successful service towards the end of WW2, These in turn could trace their ancestry to the KV series of the earlier war years. Its more notable features were the central location for the driver within the divided glacis and domed cast turret. Despite its modern appearance it suffered for cramped crew conditions, limited ammunition of 28 rounds for its huge 122mm main armament, and some reliability problems. 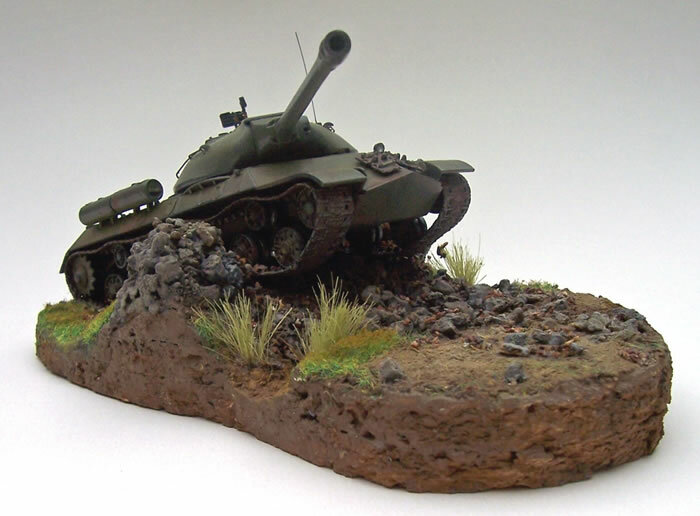 The IS-3 arrived too late for service on the eastern front. 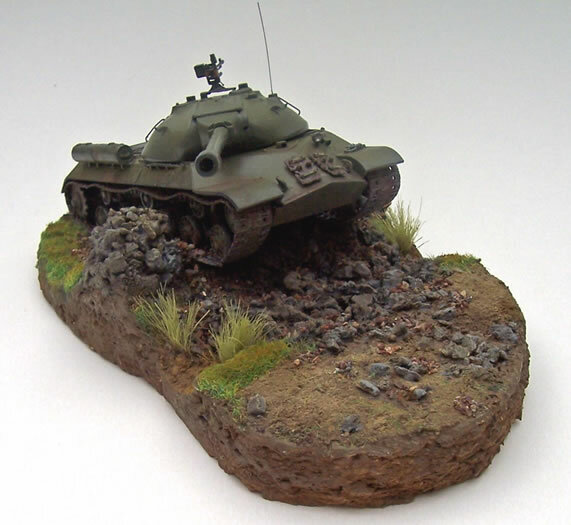 Some are thought to have been used in the Soviet Union’s invasion of Manchuria following their declaration of war on Japan just prior to the end of the conflict. They also participated in the end-of war victory parades to the surprise, if not consternation, of the western allies. It is one of these early production machines that Roden’s kit represents. These early machines were not exported with the exception of two to Poland and one to Czechoslovakia. Three side stowage hatches were added once production got into full swing, and later the tank was updated and more widely exported as the IS-3M (reinforcing ridges on the front of the curved tracked guards being a quick recognition feature of this version). 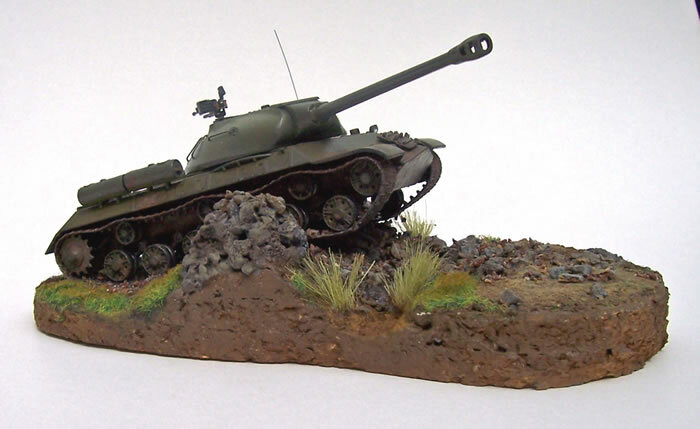 I have always thought that the IS-3 was an impressive looking tank, and I can remember just enough of the old Airfix kit to see immediately that Roden’s kit was a hug improvement over my childhood recollections. The kit is nicely moulded on the whole, with several quite fine detail parts. Like their aircraft kits with which I’m much more familiar, these small parts are easily damaged when removed from their sprue gates. The only criticisms I’d have is that the main gun barrel is not perfectly round, and looks a bit flat in section. The external fuel tanks are over simplified, and lack the characteristic circular flange at the ends as they are moulded flat, plus the small handle is missing from the ends too. I quickly realised that this kit would lend itself to having the suspension displaced as it comes with a separate swing-arm for each pair of road wheels. All I needed to do was remove the flat section in the mounting hole for each swing-arm to be able to vary their positions. I committed myself to making a small base incorporating a terrain feature to give reason for the suspension to be displaced. 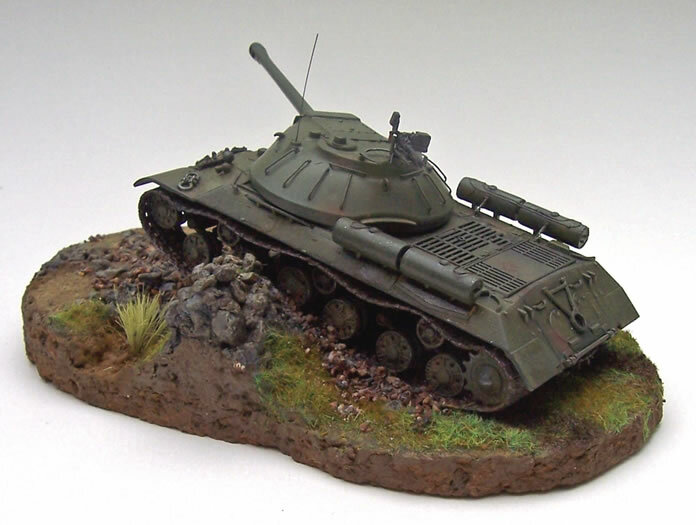 This is only my third tank, and so far I have chosen to display them on small bases as, unlike my 1/72 aircraft models, they look a bit “lost” sitting on glass shelves in my display cabinet. I wanted to keep the base small as the finished model would have to fit in amongst my aircraft models. I found that the kit generally built well with a good fit to most of the main parts. I did have to shim the mantelet area where it fits in the turret due to some slight gaps. The suspension was adjusted for fit against contours of the display base. I made the missing external fuel tank flanges by adding a circle of fuse wire to the end of each drum along with a lead foil handle (the handles are probably a bit oversize now that I look at them again). I also made a representation of the shackles that retain the tanks against their mounts. This involved making a hook and eye arrangement from fuse wire and, due my skill and patience limitations, a simplified block of plastic strip was used to represent the bracket these shackles bolt into. I ran some fuse wire from each shackle to the hull under the turret. On the real vehicle I believe these operate the quick release mechanism of the tank. I don’t know if it’s a mechanical cable or electrical wire to an explosive bolt. I have seen photos featuring two types of external fuel tank on the sides of the hull (plus two small ones on the rear that Roden provides brackets for but no tanks). One has two metal bands surrounding there circumference at each end of the tank, and the other is the type provided by the kit with no bands and the single shackle. Of this later type I saw photos and plans featuring some very fine piping looped at each end and running along the tops of the tank. I could not determine where these go or what they are for, and would love to hear from anyone who can tell me. I did my best to make a simplified representation of these from fuse wire. I made six stowage hatches from 5 thou plastic card and fixed these with stretched sprue hinges the to the hull sides to represent the main production version of the IS-3. More fuse wire was used to make the turret grab handles as this was easier than cleaning up the kit ones, and are probably a bit more in scale thickness. To do so I made a simple plastic card jig to make them all the same size. I took opportunity to drill out the headlight so I could later paint the reflector surface silver and make a lens from 5-minute clear epoxy. The horn was drilled out two, and a wire for this and the lamp run back up the glacis. My biggest problem was when the machine gun mounting ring broke into three pieces upon removal from the sprues. This proved to be surprisingly hard to fix satisfactorily. So instead I decided to make a new one from a section of plastic pen barrel and fix the gun pintle mount from the broken kit part. Unfortunately the pintle pinged off into the ether as I cut it, never to return. With frustration at my clumsiness increasing I decided to make one of these along with is reinforcing flange. I then replaced the gas tube below the fluted machinegun barrel with thin rod as this made it easier to clean up the flash on the gun barrel. Finally I added a small locking leaver at the base of the gun pintle mount. I make my bases from cork tile. In this case I made some laminations of tile to represent a field leading to a small rise at its boundary, followed by a drainage ditch and dirt road. This gave me the terrain-based “excuse” I needed to displace the model’s suspension. I then thought to add a smashed stone wall fro dramatic effect. This was possibly a mistake as my base was a bit narrow to make the breach in the wall as wide and realistic as I would have liked. But like most of my modelling, I’m focused on achieving build volume over perfection, so decided to move on and finish. I chalk up my observation to experience for future builds. The cork base was covered with some wall filler and then real dirt and smashed up kitty litter. I added a bit of paint, some washes, dry brushing plus a bit of scenic grass, and I was done. 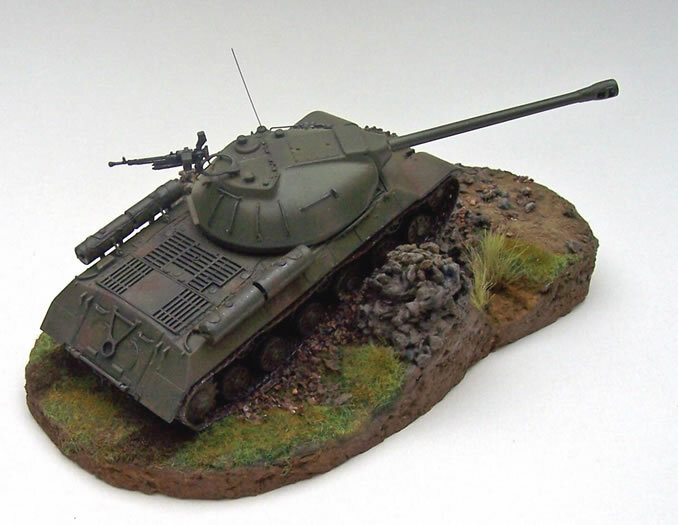 The tank was painted with Gunze acrylic FS34079 and artists oil paints. I decided not to use matt varnish as this machine is represented as simply being on exercise, and the slight sheen I had did not seem too far removed from that I had seen during my own army career on AFV’s. The vinyl tracks were painted and added. I had to cut a few unseen teeth of the drive sprocket to assist their fit and the track droop was achieved my super-gluing the tracks to wheel and idlers. Roden provides decals for four machines, being Soviet, Polish, Chinese and Egyptian. 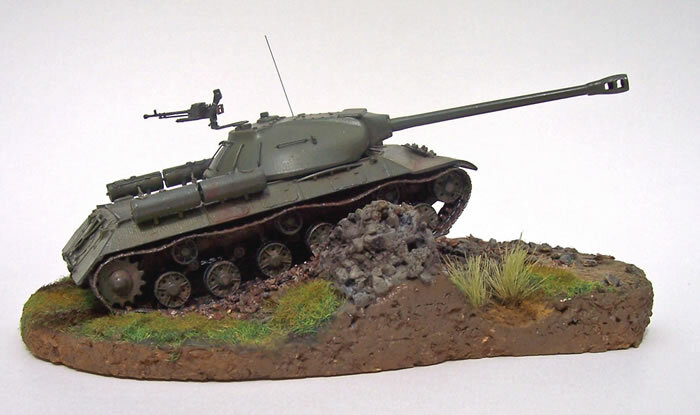 I’m sure the last two would be for later production machines to that which the kit represents, and I should think that the Egyptian should be for an IS-3M. Suffice to say that my model has no markings. I’m enjoying this tank building lark as a relaxing alternative from aircraft - possibly because ignorance is bliss and I’m basically building out of the box. To my mind this seems a quite reasonable kit, which would have been better with more detailed external fuel tanks. I also think the main production version with the three stowage hatches on each side would have been a better choice.